Against a forested backdrop of white birch trees, a family dances together. Against a forested backdrop, a family dances together. Having grown up in a large home and now nurturing one of his own, this imagery is reflective of artist Jerry Whitehead’s strong family roots and inspired his painting in the Forest Spirits Suite. The woodland imagery proposed to Whitehead by the Portico Design team draws apt parallels with the family themes he has begun to emphasize in his artwork. The idea of a forest threaded together by the literal roots of its trees is symbolic to Whitehead of the way a family is bound to one another by their common roots – their ancestry. The powwow dancers in this image represent a family standing together side-by-side like trees in a forest. 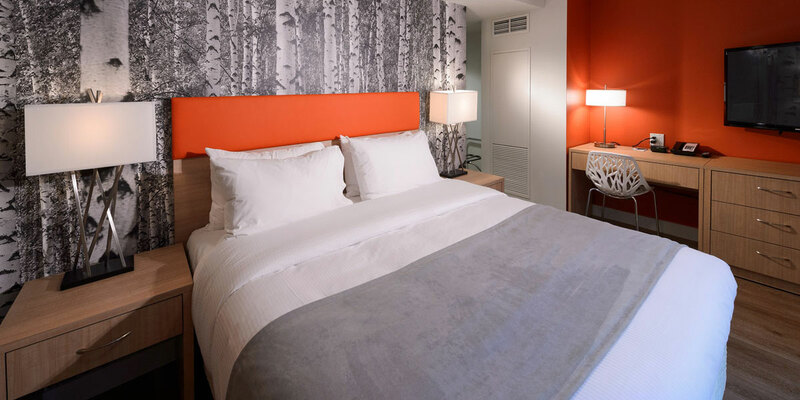 For this suite the Portico Design team drew inspiration from the vast forests that characterize the Canadian landscape and with which Aboriginal peoples have lived in harmony throughout their history. Portico Design used various arboreal images, from the woodland wallpaper to the carved tree branch motif in the desk chair, to bring that outdoor environment into the room. Inspired by the importance of birch trees in Aboriginal culture, the Portico Design team created the birch-bark wall covering. Birch bark made the best canoes, which were necessary for travel throughout the country. This feature also subtly pays tribute to artist Jerry Whitehead in whose home province of Saskatchewan the birch tree naturally grows. The aim for Portico Design was to the bring the sense of tranquility and comfort one experiences when immersed in a forested setting into the Forest Spirits Suite; sentiments which for Whitehead are tied to family and therefore complement his featured painting. 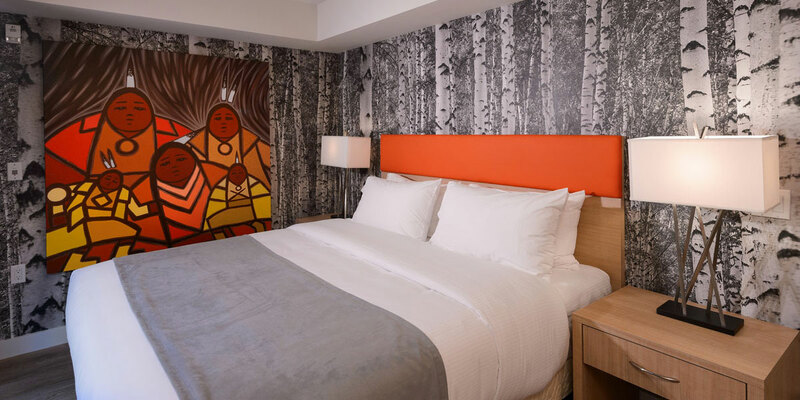 In such a way the Forest Spirits Suite expresses the beauty of the Canadian wilderness, while also speaking to the Aboriginal ancestry that exists within it.